Who doesn't love a holiday lunch al fresco? A sun-dappled Fourth of July picnic is hard to beat. On this week's Table Talk, Kim O'Donnel offers advice about food safety, grilling, and any other food issues that come up with outdoor eating. Camp food? Sure, that too. Bring your questions, suggestions, links, and tips Thursday, July 1, 1 p.m. ET, 10 a.m. PT. Sign up below for an email reminder of the chat. 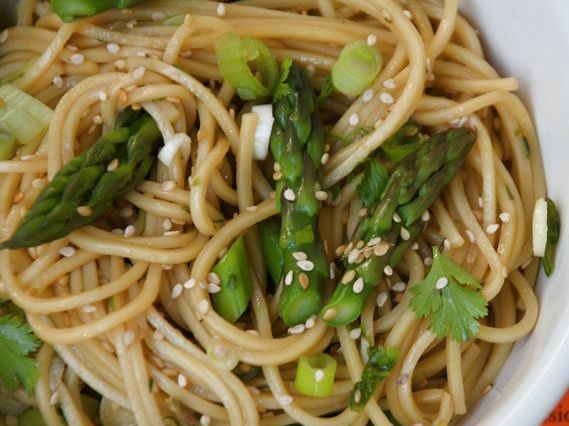 [%image reference-image float=right width=400 caption="Sesame Noodles with Asparagus Tips. "]Kim, a trained chef and longtime food journalist, is writing a cookbook for people trying to eat less meat. Every week, she brings ideas, tips, and recipes to her live chats — right here at Table Talk, most Thursdays.